This is the second volume of Franz Schubert's complete works for violin and piano, although Centaur doesn't bother saying so until the booklet notes. I have not heard Volume One, though it received exceptional critical press and I should probably review that issue as well. What I do know is that Tomas Cotik is a fine young violinist with a catholic range of tastes. Born in Argentina, Dr. Cotik and Chinese-American pianist Tao Lin present a fine program of three posthumously-published violin sonatas. These are early works, and probably written for an amateur violinist. Schubert would often play piano at informal gatherings of friends and intellectuals, so the music is appropriately difficult for these occasions. That's not to say that it doesn't sound like Schubert, because it certainly does. Though you get definite echoes of Schubert's musical heroes Beethoven and Mozart, you also get the Romantic melody and masterful chamber music interplay of Schubert himself. 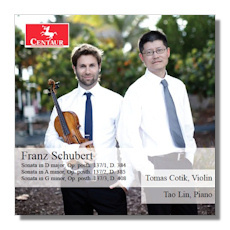 Tomas Cotik and Tao Lin play as if they were simply meeting for one of these informal house concerts, with a playful and affectionate partnership. Cotik and Tao are certainly more than mere amateurs, but they pay close attention to the historical context of these pieces and play accordingly. What I mean by that last sentence is simply this; the two artists clearly recognize what was going on during that time period. March music sounds war-like; you can imagine Schubert and friends would have known all the military music of the day, and would have either enjoyed or mocked it. Schubert would have also been keenly aware of what came before him, both masterpieces and court music alike. Thus, there are all kinds of sly winks to various music of the day, and Cotik and Lin effortlessly highlight these without ever becoming silly or mannered. Fans of Romantic chamber music will doubtless be intrigued by this carefully considered and beautifully recorded disc.